Our story focuses on Naruto Uzumaki from the Hidden Leaf village and his journey to becoming a ninja with aspirations to becoming leader of the Hidden Leaf village a.k.a. the Hokage. What sets Naruto apart from the other residents of the Hidden Leaf is the fact that he is the jinchuriki of the Nine-Tailed Demon Fox, meaning that it was sealed inside of him as a child and he because as such, he’s become quite the outcast. However, a group called The Akatsuki, wishes to capture Naruto as well as the eight other jinchurikis across the world and extract their tailed beasts from them to reform them into the Ten-Tailed Beast in which they all dervied The Akatsuki aren’t the only antagonists in the series, but they do encompass the vast majority of it. The story itself is pretty simplistic in nature, but because of the support of the characters, it branches out in a way where the majority of the characters and their pasts intertwine with one another and support the overall story as a whole. With 700 chapters and fifteen years of serialization, to keep a massive cast of characters like that in check is extremely impressive and it’s because of the characters that the story becomes deeper than it really is, but then again, sometimes the simplest idea can be something wonderful. I mean, whoever thought that a show about writing people’s names in a notebook would turn out the way it did? For example, there were some great moments in the Naruto timeline with a lot of people, myself included, favoring the Pain arc. It was one of the most epic and memorable battles in the series and Pain himself was an interesting antagonist to put Naruto up against. It was also a defining moment for a lot of people because up until now, we’ve seen Naruto train and train and while he has gotten stronger, he really hasn’t had that one true test that could utilize the growth of his character. The fight wasn’t just about being Naruto’s proving ground, however. When they also detailed Pain’s past and how he also trained with Jiraiya, it made the fight even more meaningful. You also felt as if you had a connection with Pain after seeing what he went through, how he was afraid of his Rinnegan’s power, and how growing up during a time of war can cause you to have a jaded view of the world. Pain wished for peace like Naruto did, but his goals to attain it were severely different. Because he felt this world shunned him, he wanted to bring pain to the world itself under the believe that you cannot learn, mature, and grow without experiencing pain first. While that is true when applied to real life, it made for an amazing backstory and although we’ve had some god-like characters (Madara Uchiha), Pain, to me, is still my favorite. Even though the anime recapped this in flashback after flashback after flashback, the Itachi/Sasuke story also was one of my favorites and one of the strengths of the series. It really helped flesh out the kind of character Itachi Uchiha was and it really showed how much he really cared about Sasuke. On top of that, Itachi’s very existence helped mold Sasuke’s character which, in itself, epitomized what the entire Uchiha clan was about: an unending cycle of love that breeds hatred. It also gave us a look into the Hidden Leaf’s dark past and also served as a bit of a foreshadowing to the Madara/Hashirama story which explained just why the Uchiha clan needed to be executed. When Itachi was ressurrected by Kabuto’s Edo Tensei, you knew he was going to eventually cross paths with Sasuke. The Itachi/Sasuke vs Kabuto fight was a highlight for me because it brought a nice bit of closure between the two of them. Plus when Itachi faded away after undoing the Edo Tensei, it was a nice bittersweet moment for me as I really liked how Itachi finally told Sasuke what Sasuke wanted to hear, but yet, we said goodbye to one of my favorite characters in the entire series. While those two were personal highlights for me, I believe I am in agreeance with many in saying that the final story arc with the Fourth Great Ninja War was a huge let down. First off, it seemed unbelievable that the remnants of Akatsuki could take on the entire ninja world by themselves. At this point, Akatsuki consisted of Tobi (masquerading as Madara Uchiha at this point in time), Kisame, and Sasuke’s group Taka which also included Suigetsu, Jugo, and Karin. So to bolster the numbers they throw about a hundred thousand White Zetsu clones into the mix, and in an attempt to draw out emotion from the readers, they had Kabuto ressurrect a lot of the characters that died in the past through the forbidden technique Edo Tensei. The battles derived from the Edo Tensei were pretty predictable and most of them didn’t really feel like they had much meaning other than to show that they were at war. Once we got past that we got to the section where Obito Uchiha dies over and over again before finally going away completely. He was practically killed by Kakashi only to escape his Kamui dimension. Upon arrival, he’s almost killed by Madara when Madara tried to activate the Rinne Rebirth technique only to be saved by becoming the jinchuriki of the ten-tailed beast. Then he got killed, but his body became a vessel for Black Zetsu, but somehow through a plot device, he absorbed some energy and came back to life only to die again during the fight with Kaguya. Obito just refusing to go away was one of the more annoying story plots in the entire manga and quite frankly, I got sick and tired of seeing him come back time after time again. I remember yelling “FINALLY” when he finally did die even though a part of me wondered if he was going to come back again. Thankfully, he didn’t. Then let’s not forget the final boss after final boss after final boss chain of events. So Madara becomes human again and returns to being the Second Sage of the Six Paths. He activates the infinite tsukiyomi and pretty much wins, but Sasuke’s susano’o somehow blocks the genjutsu and keeps himself, Naruto, Sakura, and Kakashi from being placed under the spell. After what seemed like an impressive battle, Kaguya just erupts out of Madara’s body in one of the most anit-climatic moments in the series. I don’t really understand how you can build up a character like Madara Uchiha, make his life seem like the stuff of legends, and then just abruptly end his life like that. I was SEVERELY pissed when they introduced Kaguya and felt it was a complete waste of time to do so, but it gets better (and not in a good way). We are then treated to having Black Zetsu, a menial character at best, being revealed as the mastermind behind EVERYTHING. When I say everything.. I mean EVERYTHING. As hard as that pill was to swallow, the ensuing fight between Sasuke/Naruto and Kaguya was extremely disappointing. For someone who was the first person to use ninjustu and someone of the level of a god… Kaguya wasn’t really all that impressive. Her highlight was the ability to summon entire dimensions into order to change the scenery for the battle. Her backstory was extremely rushed and when it was attempted to be explained, it wasn’t all that interesting. In fact, she was downright boring and very unworthy of being a “final boss” character. In fact, I would have been happy with her not even being in the manga at all and just transitioning from Madara to everyone’s most-anticiapted fight… Naruto vs Sasuke. So when they defeat and seal Kaguya away, Sasuke ends up becoming, seemingly on a whim, the final final final boss. I felt this was pulled off just so we can get the Naruto vs Sasuke fight done and over with. It’s rather unbelievable for Sasuke to go from pure hatred for his brother, to pure hatred for Konoha, to reuniting with his brother and questioning his hatred, to meeting the four kage and deciding to protect Konoha, fight for the world during the war then, all of a sudden go.. “welp… time to destroy the world.” It feels as if he literally pulled a 180 at the end of the manga just for the sake of having the fanservice fight. At this point, we know the manga is ending in five chapters so the most anticipated battle of the entire series ends up being rushed as well. While some parts of the fight were kind of impressive looking, it wasn’t anywhere near what I was expecting it to be. In fact, if they cut out the entire Kaguya arc all together, we could have spotlighted more of Naruto vs Sasuke and probably had it as the epic battle it was built up to be over the past fifteen years rather than the afterthought it felt like. The ending was hit or miss with some people. I, personally, enjoyed it and I felt like it seemed to tie everything up into a nice little bow, but others thought disliked it mainly becuase they didn’t like the hundreds of ships that happened in it. I think Oprah Winfrey making a cameo and stating “You get a wife! You get a wife! Everyone gets a wife!” would be highly appropriate as that’s exactly how it felt. The ending still left a few questions to be answered such as where did Orochimaru go? What happened with Yamato and how did they turn him into Spiral Zetsu? How come we still haven’t seen Kakashi’s face even though Kishimoto said we would? Nevertheless, despite the highs and lows, the story was pretty enjoyable. There was a pretty decent balance between action and slow parts which were reserved for backstory, but the one thing that really annoyed me the most was that 99% of the fights involving Naruto ended with Talk no Jutsu. In fact, I can remember him killing Kakuzu when he used the Rasen Shuriken for the first time, but after that, Pain killed himself after listening to Naruto, Obito also fell prey to Talk no Jutsu, even Sasuke, in the end to some extent.. but that one was more like Feelings no Jutsu more than anything. Thankfully, there are plenty of other battles that happened during the series that make up for it. There are tons of characters in the Naruto universe. Some I liked, some I downright hated. As I mentioned above, I really loved Nagato (Pain) as an antagonist. Being a former student of Jiraiya, growing up during the Third Great Ninja War, experiencing the death of his childhood friend Yahiko when he suicided on Nagato’s kunai, to even using Yahiko’s corpse as a puppet to carry out his missions, Pain’s message of how you can only mature and grow up by experiencing pain was pretty deep. That notion made Pain really seem unique. Plus, it was the first time we got to see the legendary Rinnegan and got to learn about some of its powers. When Pain laid waste to the entire Hidden Leaf Village, it was a surreal moment. It made you realize that he was the leader of Akatsuki and this was the core of the group’s power (although later on he was just a puppet for Obito like everyone else in that group). Even though he was defeated by Talk no Jutsu, the fact that he placed his faith in Naruto and used the Rinne Rebirth to bring everyone back was kind of a nice moment that conveyed the message that it’s okay to let go of the pain and put your trust into someone else. I don’t know if it was THE fitting end for Nagato, but it was an end nevertheless. Itachi Uchiha is my other favorite character from the series. Itachi takes intelligence and planning to a whole new level. Itachi planned for things well beyond his death as if he had the gift of foresight. While many wrote this off as Plot no Jutsu moments, it was pulled off in a way that made Itachi seems highly intelligent. The fact that he implanted Shisui’s sharingan in a crow then gave it to Naruto for his upcoming battle with Sasuke only to use it later to undo the control portion of the Edo Tensei over himself was pretty smart. Even how he overcame Kabuto’s saje power which blocks genjutsu to place him under the effects of Izanami was also a nice touch during that fight. The fact that Itachi used Izanami there and knew of it made one wonder just how much did Itachi know about the sharingan? As far as pesonality, Itachi always kept his composure and had an uncanny ability to analyze every situation he was in. His mastery over genjutsu was also feared by anyone who heard his name and his power garnered respect from both his friends and his foes. Because he threw away his life in order to protect his brother and Konoha as a whole, Itachi became the perfect example of a dark hero and I think that’s why a lot of people, myself included, liked him so much. While those two are my favorites, I did enjoy most of the characters in Naruto, but there was one character i didn’t like and wished that the took a different approach to… and that’s Killer Bee. I don’t like rap, hip hop, or anything of the sort. so basing a character around that instantly turned me off. I understand the reasoning for introducing him since he is the Eight-Tails Jinchuriki, I just could never connect with him and I often wished he had a different personality. Personal tastes, I suppose. As a bit of redemption, he did have a pretty good fight against Sasuke’s Taka group right after they joined Akatsuki, but outside of that, he seemed like an afterthought during the Fourth Great Ninja War. In fact, Naruto died after having the nine tails extracted from him, but when Bee had the Eight Tails taken out by Madara, he simply disappeared from the manga with little explanation. In fact, he just randomly shows up later and that’s pretty much about it. I actually asked myself if Bee died alongside Naruto, but they never really fully explained just what happened after the extraction. Kishimoto almost didn’t do this series. When he tried to break into manga, his style was very senin-based. This was mainly due to the fact that he was a huge fan of Akira and wanted to emulate that style, but since his dream was to create manga for Weekly Shonen JUMP, he needed to change his style and eventually, he found a style that worked. In fact, it worked so well that as of last year, Naruto has solf 131 million copies in Japan alone! Since Naruto is about the shinobi world, Kishimoto gives you a unique spin on what a ninja looks like. When we think about ninjas, we think of things like Ryu Hayabusa from Ninja Gaiden. We think of swords, being silent, all clad in black complete with a mask, throwing stars and smoke bombs. The world of Naruto isn’t like that at all… especially when our main character is clad in a bright orange jump suit. Each village, however, does have a unique look to it, but most of the ninjas look like they out on a camping trip rather than being the stealthy masters of assassination that they’re fabled to be. Over time, the character designs do change for some of the sub-characters, but the main characters did receive all of the eye-catching attention and their designs only improved over time. In fact, it’s because of those unique designs that you could take one look at a character and know exactly who they were unlike Tite Kubo’s ability to just draw a variation of Captain Aizen in Bleach and call it a new character. If I had to pick a favorite character design, I’d have to pick Madara Uchiha in his Sage of the Six Path’s form. I know that happened toward the end of the manga and because as such, would be at the forefront of my thoughts, but I just really liked the overall design from top to bottom. Having the Six Path’s robe and weapon made Madara look peaceful despite the fact that he was extremely deadly. As far as backgrounds are concerned, the Hidden Leaf village received the most detail and, honestly, we never really got that same treatment for the other four villages. They were simply there to exist and that’s kind of a shame. Kishimoto; however, didn’t really give off the vibe that he was too skilled at backgrounds. While the Mt. 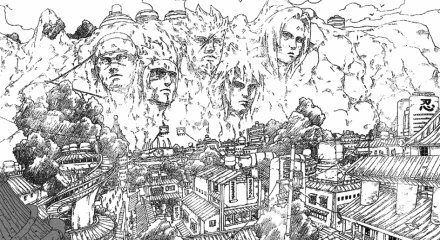 Rushmore of hokages was nicely done, he certainly is a far cry from Hiro Mashima (author of Fairy Tail) when it comes to building design. When it came to scenery, I know it’s difficult to convey settings in black and white, but often times, I had to wait for a chapter to become animated just to figure out where they were and what the background looked like. I couldn’t imagine it by reading the manga all too well and that’s kind of a downfall, but when you have a battle manga like Naruto where things are constantly getting destroyed and the world itself constantly being reshaped by the sometimes excessive ninjitsu abilities, backgrounds don’t really need the most attention. What Kishimoto pulls off is adequate enough. Besides, you didn’t come to see how pretty the forest was… you came to see Naruto drill a hole through someone with a Rasengan, right? Naruto was, is, and always will be a staple when it comes to manga. Along with Bleach, One Piece, and Fairy Tail, it will always be a measuring stick to what a successful shonen manga should be. In that sense, it is truly a masterpiece crafted by a man who has had a passion for manga his entire life. While the story had its ups and downs, the pacing seemed fine with the exception of the final arc. I think fixating on the number 700 really hurt the potential of an amazing ending rather than just a satisfying one. I think things could have been drawn out a bit more in that regards so we could get closure that didn’t feel rushed or forced. Outside of that, everything had its purpose. Back story was placed where it was needed, the characters received the attention they deserved, and even though some felt that some story arcs were too short or too long, in the grand scheme of things, it really helped everything fit together nicely. For me, Naruto was the gateway into manga and anime. Before I was introduced to it by a friend, I had only seen Sailor Moon, Samurai Pizza Cats and The SoulTaker. The first two I wasn’t even aware that they were anime. I was just a young kid watching a cartoon back then. The SoulTaker was the first show I watched that I knew was an anime. After that, I didn’t really watch much (and who could blame me? SoulTaker was horrible) until my friend introduced me to Naruto. I had heard of it, I knew it was a mainstream show, but at first, I wasn’t really interested in trying it out. After enough pestering and badgering, I finally watched it and I actually enjoyed it. I started right when the Shippuuden series began airing and since I enjoyed that a lot, my friend urged me to read the manga since it’ll explain a lot and plus, the manga was ahead of the anime. I started reading it from the beginning and absolutely loved it all. I stuck with it until the very end and don’t regret doing so one bit. It was thanks to Naruto that I got into other series such as Bleach, Fullmetal Alchemist, D.Gray-man, and Fairy Tail. Whether its for pure nostalgia or the fact that I actually enjoyed this series from beginning to end, I’m going to award this a 9 out of 10. It is an epic. It is a masterpiece. It is one of the measuring sticks for shonen manga. Thank you Masashi Kishimoto for fifteen wonderful years of hard work! I wasn’t there from the beginning, but I’m very happy I was there at the end and I’m looking forward to the Naruto mini-series that will be debuting in April 2015. Naruto is, was, and always will be a staple when it comes to manga.